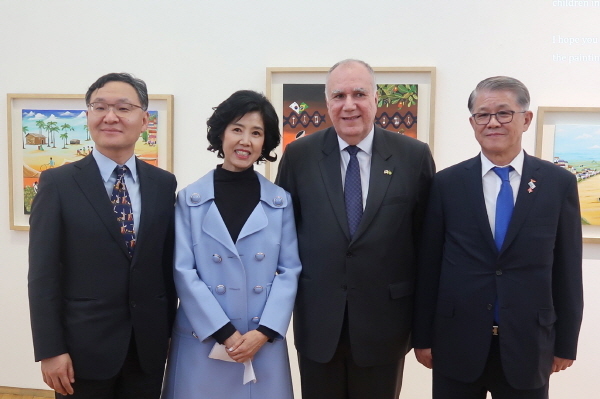 On the occasion of the opening ceremony of the Brazilian Embassy's Cultural Program and the art exhibition entitled, "We Are One", Ambassador Luis Henrique Sobreira Lopes of Brazil, together with the Korea-Brazil Society, hosted a reception at the Embassy of Brazil in Seoul on Mar. 19, 2019. The Embassy of Brazil hosted the cultural program with an art exhibition entitled, "We Are One" in celebration of the 60th anniversary of diplomatic relation between Korea and Brazil. From left to right, Director-General Jo Yung-joon of Ministry of Foreign Affairs, Artist Jeon Ok-hee, Ambassador Luis Henrique Sobreira Lopes of Brazil, Chairman Choi Shin-won of SK networks. The reception was attended by many Korean and international guests, as well as the ambassadors and other senior members of the Seoul Diplomatic Corps. Among the guests in attendance were Chairman Choi Shin-won of the SK Networks Co Ltd., Director-General Jo Yung-joon of the Ministry of Foreign Affairs for Latin American and Caribbean Affairs of Korea and Ambassadors Antoine Azzam of Lebanon, Luis Pablo Ossio Bustillos of Bolivia, Enrique Humberto Salazar Caraballo of Dominican Republic. From the Korean society came many distinguished guests from all walks of life, including the media, whence came reporters of The Korea Post media. The guests also included Director Kim Won-ho of the International Cooperation and Strategy. According to Korea-Brazil Society, KOBRAS is a private organization aimed to boost exchanges and cooperation about various field e.g. Business, Culture, Sports between Brazil and South Korea. Chairman Choi of SK networks Co Ltd., concurrently chairman of KOBRAS, stated, "The Embassy of Brazil and Korea-Brazil Society invited artist Jeon Ok-hee for celebrating the 60th anniversary of the diplomatic relations." Then he added: "I will support to promote cultural exchange for strengthen bilateral relations between Brazil and Korea." Korean Painter Jeon Ok-hee who works as an artist in Brazil held the art exhibition "We Are One" at the Embassy of Brazil. She painted simple, beautiful and natural characteristics and lifestyle of the Brazilian with Korean emotions and coloring style. Her painting expresses colorful, peaceful and relaxing rural landscape. The art exhibition, “We Are One”, which was hosted by Embassy of Brazil in Seoul with Korea-Brazil Society is open from Mar. 20 to May. 19.